← NEWS FLASH!!!!!! “ANGLO-AMERICAN” ISN’T A “DOG WHISTLE”!!!!!!! Well, I’m awful late for this, but, I thought I’d add my 2 cents towards this discussion. As most of us are aware, president Trump has announced he is going to impose tariffs on imported steel and aluminum. He’s also hinted at additional tariffs ……… much of the world went insane at the announcements. Sadly, many so-called conservatives (they’re actually globalist ‘free-traders’) have joined in the chorus as to what a great folly this would be. What astounding ignorance displayed!!!!! Those who have paid close attention to my writings in the past know I’ve advocated such tariffs and still do. I will attempt to give a brief recap of all of the posts advocating or alluding to such advocacy and why ……..
First and foremost, and I want to be clear, tariffs or the presumed tradewars from such tariffs are not always good. It greatly depends on the position the nation is in. Indeed, there are very few nations in which a trade war could be beneficial. However, tariffs are always beneficial if the opposite nation does not reciprocate in kind. The US doesn’t need anything from any nation. I can’t think of one resource or raw material which fills a need that the US doesn’t have. I can’t think of one product, produced by another nation that the US needs. The same, however, cannot be stated by much of the rest of the world. Oh, btw, while it shouldn’t have to be stated, I feel it might for some readers. The job of the US government is to work in the interests of the US people, and no one else. So, what are the potential consequences of tariffs and counter tariffs and trade-wars for the US? Yes, costs of products may increase, but, perhaps, only temporarily, and perhaps inconsequentially. As many faithful readers know, I like my beer. Well, that’s an understatement, but, I’ll leave it at that. I’m told the suggested tariff imposed on aluminum may cause the price of a case of beer to increase by 5 cents. …… no problem, I’ll just switch to bottles!!!!!! jk!!! Seriously, this then becomes a question where I’d rather have my money go. Aluminum, steel, beer …….. doesn’t matter. If I pay a dollar for a product and much of that dollar goes overseas, well, we as a nation have exported our wealth. However, if I have to pay $1.05 for the same product, but, the money stays in the US and provides jobs for Americans, then, the payoff is exponentially preferable than the cheaper beer, I-phone, automobile …… doesn’t matter, it’s a huge win for me, America, and the American people. You see, that’s more jobs for American people to fulfill a demand. That’s more taxpayers, that’s less people reliant upon govt assistance, that’s higher wages because of the competition for workers! That’s more general wealth for Americans which then creates more demand for goods and services! Oh, did I mention “demand”? Well, then, we should also mention the other side of the equation …… “supply”. Recall, I said the cost increases may be temporary? Yes, that’s because there likely will be an increase in the global supply of a product. Let’s say the steel tariffs causes the US steel industry to recover to past form…… suddenly the global supply of steel is dramatically increased. What happens to prices when there is suddenly much more supply? Well, what has happened to the price of oil? The world is progressing. It is modernizing. Until this stops (I doubt it ever will), there will always be demand for energy and materials. I think it best for the US to be the provider of such rather than nations such as China. We should not acquiesce any industry to any nation until such a time that there is no significant demand for the product of said industry. Again, I’d like to state, these notions are for the US only. Other nations are not in such a position. In economics, nations must play to their strengths, and mitigate their weaknesses, else, ruination is sure to come. They must ensure the economic well-being of their populations. If they have minerals, let them mine and compete, if they have crops, have them farm and let them compete, if they have fishing, let them fish and compete, if they have woods, then, ……. oil, gas, coal, ……… it is a matter of happenstance, or, as I like to believe, Providence, the US has it all. We should not squander our wealth and assets. 58 Responses to Tariffs!!!!!! Yea!!!!!!! We managed fairly well before we gave it all away. Somehow we were even able to buy beer. Tariffs are bad. Yes, we can do without the rest of the world’s resources. But it will drive up prices. And that is bad. Think effects of minimum wage on entry level employment. A tariff on steel may save 1000 steel jobs, but due to the increase cost of steel, it will cost thousands of jobs in automotive, computers, sodas, beer – all the industries that use steel. No commodity is price inelastic. Higher price means lower demand. Lower demand means fewer jobs. That is simple economic reality. I hope this is only the opening gambit of Trump. I suspect it is. Trade wars are not the enemy. Higher prices are. Don’t we already have tariffs on just about everything anyway? There are some tariffs, but mostly on small (dollar value) items (sugar, wheat, etc.). There is indeed a trade war in sugar, but since 90%+ of that is in finished products, you do not see it much (google candy companies moving to Canada). But as I said, trade wars are not the big problem. Higher prices are. And indeed, you do pay a lot higher price for processed sugar products than you need to. But as they are not necessities, and of course being villainized by the PC, no one is talking about them. As it does not cost much to close a shop and open a new one (unlike steel). I think that’s all a temporary price to pay for the longterm benefit of bringing more industry home. The market here will eventually adjust to the prices it can bear. Maybe painful for little while, but continuing to bleed money from our economy into foreign ones, is unsustainable. Higher prices for awhile, but the money stays here. I’ll take it. There was gonna be some pain involved to correct it. A lesson learned hopefully. I think we’re about maxed out on how many foreign economies we can help create. Phil, I rarely disagree with you, but, in this instance, I do. Sure, there are higher prices, but, then, there is more value/money being generated. And, that only assumes a static result. Ben Franklin had this to say …… To be thrown upon one’s own resources, is to be cast into the very lap of fortune; for our faculties then undergo a development and display an energy of which they were previously unsusceptible. …… Guaranteed, the burgeoning US industry will find better ways to do things, resulting in better production in terms of efficiency and quality. Sure, in the ideal world, a tariff free world would be desired for the world. But, I don’t live in the “world”, I live in the US. I would much prefer my money spent to stay in the US rather than export it to the “world”. I would pay a bit more to ensure just that. I thought it was self evident that we disagreed. The higher prices come at a price. Lower employment. People can only buy less. Yes, it is a great concept to think we can be totally self sufficient. So where are they going to plant the rubber tree plantations? Tariffs are never a good thing. In some cases they are necessary (to prevent dumping). But the cost of tariffs are a lot higher than the savings. The 1000 steel worker jobs saved will cost thousands of jobs in Automotive, appliances – anything that uses steel. When the price of a commodity goes up, the demand goes down. This is a law of economics. Not a theory. And when demand goes down, less is sold, so fewer workers are needed to make the few that are sold. Lost jobs. It is a feel good idea. But it is a bad practice. It was a direct cause of the great depression. And its continuance (there were other causes – I do not mean to imply it was the only cause). Tariffs did not create the steel industry. The Great Lakes did. The 1930s tariffs were meant to protect the industry, and instead contributed to the recession. Sure, it was only American steel, but then no one could afford to buy the finished products. Hmm, I’m not sure that’s a proper viewing. The steel industry doesn’t work in a vacuum. Neither does the aluminum industry. Yes, higher prices means less demand. However, when considering the global markets, an increase in both industries in the US would mean an increase in supply, thus creating a downward pressure on prices. Further, an increase in the steel industry would mean an increase in the coal industry and other mining industries, along with increased demand in earth moving vehicles and equipment. Aluminum is pretty much the same story, to make it, we must have mining and greater energy supply. I believe the effects of keeping our wealth in the US combined with the necessary increases in the various industries will outweigh the negative effects of the minimal price increases. ……. I guess we’ll soon see. BTW, I think synthetic rubber has proven to be superior in many ways over real rubber. Sorry no, your basic premise is flawed. The point of tariffs is to INCREASE the price. It might increase the supply world wide, but NOT in the country where the tariffs were enacted, That is the point of tariffs. And yes, there are some minor ripple effects (like coal to stoke the furnaces). But they are minor. When a Refrigerator goes from $1000 to $2000, a lot of folks just fix their old ones, and forgo a new one. Lower demand. Lower demand, less units sold. Less units sold, fewer folks making them. There are empirical studies that show tariffs cost 10-15 times more jobs than they save. And that is always the case. Tariffs raise prices. That is the intent and design. Now if the point is to prevent dumping (selling below costs), then a targeted strategy (see Chiefio) that penalizes in kind the dumpers is much more effective than wielding a hacksaw to remove a tumor. Again, we’ll get to conduct an empirical study! But, aren’t these tariffs in response to “dumping”? The Chinese build uninhabited cities for fun….. and employment. Of course it’s dumping!!! It’s a communist state. The pay of the people making the steel, from top to bottom, have nothing to do with the economic realities. It is not sustainable, on it’s own, but, in the meantime, it causes harm to the US population. US Steel CEO David Burritt credited President Trump’s tariffs for prompting the reopening of an idled plant in Illinois. The reopen will take four months, during which the plant will restart two blast furnaces and steelmaking facilities bringing 500 jobs back to the area. I’m almost certain this guy just said it will create thousands of jobs here in the USA…. We’ve belonged to the world for a long time. It is not as simple as it would look at first sight. You present only one side of the medal. The current global financial system works with the $ as the reserve currency. It is both a curse and a blessing. It allows the US to run a tremendous deficit, but it also requires US to run a deficit. Just imagine what the economy would be without the deficit? Just try to cut out the deficit from spendings. What do you cut out? What further consequences would that cut have? So reducing the deficit through tariffs is a way to try to control it and find the best midway, however it may lead to global movements and eventual crisis. The 2008 crisis is in reality still there, it has been postponed and a lot of new money has been generated to mitigate it. All that money stays in suspension in assets, stocks, bonds and global trade and many financial instruments. It is a giant house of cards waiting to collapse due to the way how we generate our fiat money: through banks out of debt. Money is generated on an exponential path (a certain % each year is an exponential function) and the banks need inflation to consume existing money. That’s why the 2% target inflation and the trick with CPI but that is a very sensible work and each small variations can cause problems in the current status with debt at around 100% of GDP. Either inflation comes or a crisis of a kind or another cleans up some debt. Only one country did the right thing with 2008: Iceland. Tariffs war can create some trouble in this house of cards. Well, right. I wasn’t really addressing the government debt/deficit. This will help, minimally. I’ve given up on the notion our government will ever act responsibly in this matter. Sooner or later, the piper will come calling. There’s no escaping this. There simply isn’t any political will to taper the spending. However, the budget crisis of the Obama admin did actually demonstrate how easy it would be to operate without a deficit. Indeed, we did. Given the increase in our economic condition today, it would be even easier. But, we’re not going to. At some point in time, it will all come down. It will cause a global depression because of the globe’s use of the US Dollar. Perhaps a few large-scale wars. Things will significantly change. Getting a nation closer to self-reliance is the best strategy in this situation. Correct, Lars. As long as the dollar is the world’s reserve and prime trading currency, we *must* export dollars to meet the demand. I have a ‘trade’ deficit with my grocer. I’ve had it all of my life, even considering gardening. The only deficit I worry about is my current account deficit. No-one wants to truly fix this problem. The problem isn’t so much ‘fiat’ currency as fractional reserve banking against demand deposits. That’s the ultimate in borrowing short to lend long. Fix that, let the deflation happen and expedite the bankruptcies. It’ll be over in a year to 18 months. We can survive it. How do I know? We did it before. Unfortunately, it’ll be bad because it has gone on 100 years now. That said, I have no issue with targeted, time limited reciprocal tariffs for truly significant national security needs. By all means, we should have such insurance policies; but they should be subject to automatic sunset and have objective metrics for success. Too easy for ‘big government’ to cheat otherwise. international trade balance might have disappeared completely, but fortunately Americans were spared that much “good” news. The basic facts about international trade are not difficult to understand. What is difficult to untangle are all the misconceptions and jargon which so often clutter up the discussion. 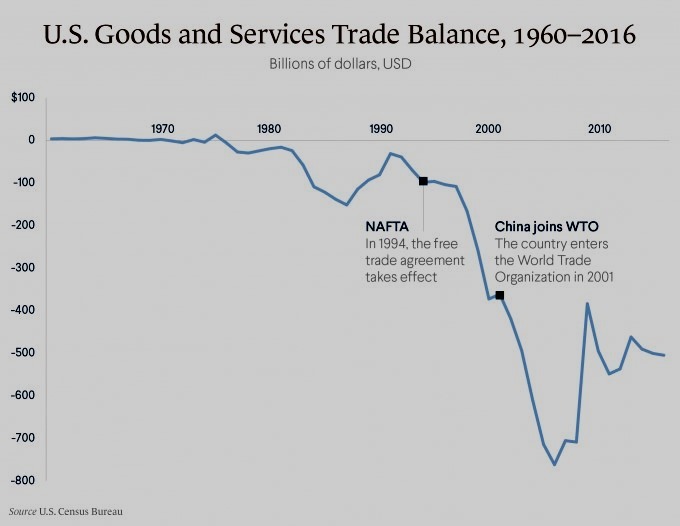 For example, the terminology used to describe an export surplus as a “favorable” balance of trade and an import surplus as an “unfavorable” balance of trade goes back for centuries. Incidentally, during the Great Depression of the 1930s, the United States had an export surplus–a “favorable” balance of trade–in every year of that disastrous decade. But what may be more relevant is that both imports and exports were sharply lower than they had been during the prosperous decade of the 1920s. This reduction in international trade was a result of rising tariff barriers in countries around the world, as nations attempted to save jobs in their own domestic economies, during a period of widespread unemployment, by keeping out international trade. Such policies have been regarded by many economists as needlessly worsening and prolonging the worldwide depression. The last thing needed when real national income is going down is a policy that makes it go down faster, by denying consumers the benefits of being able to buy what they want at the lowest price available. So do we want a good economy and more jobs, or the “feel good” actions of raising tariffs? Well, I think Dr. Sowell’s point was that a trade imbalance doesn’t an economy make. He’s certainly not advocating an “import surplus”. The reasons why we narrowed our trade deficit in those times he described is because we didn’t have to money to import as much. Today, that’s less of the case. I believe the tariffs, if properly managed, can result in a better economy with more jobs. Many fall under the siren song of cheaper foreign-made goods, underestimating the negatives that also creates. And overestimating the value of international trade in general. We’re 300 million people. Blessed with resources. We could be our own producers, and our own buyers. For probably everything. Would anyone not like the 7 $trillion or so to OPEC back? Who knows how much to Asia. Would we not be in much better shape today? And prices would have evened out in the end, like always. One of the 2 greatest living economists. He has forgotten more than most people will ever know. An aluminum plant that took raw bauxite and made into aluminum closes a couple years ago near Corpus Christi, TX. That tariff alone is not bringing it back. The US has to import a lot of other materials that is not much talked about. Rare earths, uranium, nickel, oil, and many other materials or resources. Free trade/managed trade has been a disaster. I believe NAFTA helped the agricultural sector and but also led to mass unemployment in Mexico once it became a primary buyer of corn for example. I found this very interesting post on Dirk’s blog about roman maths, algebra, indians and the number zero. Have you ever tried any distro? Well it is your choice. There is Gimp on linux but not sure how that compares with photoshop. I use open office, email, browsers and some other tools I find useful. There are many linux tools and features, but I know how it is when you get used to a software and are productive with it… difficult to change. One way to change is installing dual boot, (eventually on two different harddrives with access to the data from both) that makes the transition smoother, you can any time check back how it was. How did that big girl get to be head of the FBI? James….Anthony featured your “temp on a thermometer” graph in one of his posts…..gave you credit for it too! Heh, that’s a nice one Latitude! Hopefully James has some time to answer the coming week-end! Good to hear that! It makes sense, plankton being basically plants and CO2 plant food. It is good to see the numerous alarmist posts are just that, alarmist posts built on dubious ‘science’ claims. There are enough pollution problems, the CO2 saga is a distraction from real problems. So, for plankton the greening of Sahara would be a catastrophe? Who would have thought…. One of the very important question is what kind of genes would they have? I’m alive, but, just barely!!!! I took a job which I probably should not have. The aero industry is full of imbeciles. I’m stuck in a world of stupid. That said, I’d be very surprise if there were not some form of life on Mars. …… it pretty much has to be. As towards the genes, I’ve no idea. Lars, one day, I’ll blog again. And, I like this blog …… so, that’s why it’s still active. I truly miss the interaction with the bright people who used to come here. I learned so much from you guys …… sadly I’m stuck in a world of stupid, at the moment, where 60, 70, and even 80 hr work weeks are not uncommon. One day, my friend, I’ll be back, up and running! …and we’re going to hold you to that too! Miss talking to you too…. I wish James would come back. I’m spending my time on WUWT, and it isn’t pretty. Surprise surprise! good to see there were some answers after all, the blog is not dead yet but in deep hibernation! Well, just passing by to check for news and to wish a Merry Christmas everybody! So Suyts – what are your thoughts on Schlapp for Roberts? Oh, and I hope everyone had a great Christmas. And the best of 2018 is not as good as the worst of 2019.